Chopper Exhaust Advice, Tips, And -- To Wrap or Not To Wrap? In this guide to chopper exhaust pipes we go over the basics to the types and tips on what to choose for your bike. Nothing says chopper like a set of loud pipes. It is the ultimate expression of rebellion and captivates other motorcyclists as well as bringing a level of safety for the rider. The phrase "the louder the better" should apply to every chopper, right? In truth, this is not completely true. While being heard is good, being heard too well can get you a ticket or possibly keep your bike from passing inspection in many states. On top of that, you need to pick a design of chopper exhaust pipes that are appropriate for your riding needs. A set of completely un-muffled shorties look awesome but after about twenty minutes of riding you will wish they were factory pipes. If you are planning to ride your bike to rallies or even just during the rally to participate in group rides, you may want to find pipes that offer at least a slight bit of muffling effect. There are design elements that affect sound too. The Look Of Your Pipes. As was just stated, un-muffled shorties look great. However, shorties would not look that great on a chromed out Ultra Classic, would they? Aside from the fact that you would probably melt your saddlebag off, they just don't fit the bike. The look of your pipes can be a great expression of your personality but there are some basic rules. Shorties look good on classic choppers and "rat-rods", all sorts of variety can be had for modern choppers that works and dual outs are most appropriate for baggers. Depending on the type of bike, coating or wrapping the chopper exhaust pipes can be a great option for not only improving the look but the performance of your chopper. Either a ceramic coating or fiberglass wrapping serve one main performance purpose: they prevent heat from escaping the exhaust pipe. This keeps the engine cooler, which is especially important on air-cooled engines. Wrapping shorties looks great and really adds to the feel of a rat-rod style chopper. Even more traditional choppers will utilize the wrappings to enhance the look and give it an old-school feel. The downside to wrapping is it can speed up the deterioration of the exhaust pipe itself. It can trap moisture and cause rust; plus wrapping just doesn't look right on all chopper styles. The modern solution is ceramic coating. There are companies that provide ceramic coating and it can be had in various colors, from white to black to chrome. The process looks great and works better than wrapping to keep the heat in the pipes until it exits the back of the bike. It is a cheap modification that can give performance and comfort benefits as well as enhancing the look of the bike. The look of your pipes can change the look of your motorcycle. 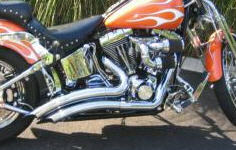 Exhausts can be elegant, rude looking, or overwhelm the bottom side of the bike with chrome. However, whatever your personal taste is in motorcycle parts, the most important thing is to remember that whatever you buy must actually fit the size and other specifications mentioned by the manufacturer of the bike! The full pipes system is connected to the head of the engine and the slip-on pipes connects to the opening where your stock muffler is usually found. If a high end powerful performance is what you are looking for, than a full pipes system is best for you. This pipes system suits drag racers, long distance bikers and motorcyclists who frequently run their machine at full throttle. Almost every cruiser or drag racing bike is outfitted with a full pipes system to ensure optimum speed, power and control on the road. The slip on pipes system is best suited for what are called "stop and go riders." These include commuters and individuals who use their motorcycle infrequently or only for short trips within the city. The benefit of using a slip on motorcycle pipes system is that it gives your bike what is called "low end" power. This allows you to start and stop more easily. A slip on pipes system is also needed in order for a professional rider to pull a "wheelie" or dart the bike as if turning on a dime. 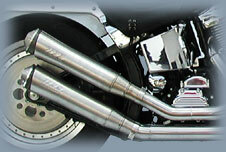 Drag racers will also employ high mount and low mount motorcycle pipes systems. These are a type of slip on motorcycle pipes that call for the raising or lowering of the motorcycle seat depending on the maneuvers that the driver wants to perform. High or low mount pipes are not recommended for individuals who like to carry passengers. Once you have decided on which pipes system is best for you, experts advise adding three extra components to your installation package. These additional motorcycle parts prevent stains, engine damage and undesirable performance. First of all it is recommended that you install a fuel management system along with your new motorcycle pipes system. This allows the airflow and fuel in your pipes to harmonize so that your bike runs smoothly. A fuel management system also prevents your pipes from deteriorating and turning a brilliant blue. If your bike is fuel injected, you will need to install a type of fuel management system called a power commander. If your bike has a carburetor you will need to install a fuel management system called the jet kit. Secondly it is recommended that you install new pipes gaskets every time you replace the motorcycle's pipes system. This prevents your pipes from leaking and damaging the engine. Thirdly it might be a good idea to replace your air cleaner as air is the key to getting more power out of your bike. This also allows for the optimum chemical reactions to take place in your pipes so your bike can run at optimum efficiency. There are plenty of used or cloned pipes to be found in that part of the motorcycle market called the aftermarket. Exhaust systems for all types of bikes including Harley Davidson, Honda, Yamaha, Suzuki and Kawasaki brands are widely available both as cloned versions or the real thing.